It's the first day of a sparkling new year - so what better time to talk about the nuts and bolts of getting and staying organized? Your first step to organizing your entire life this year is to invest in a good quality day planner. 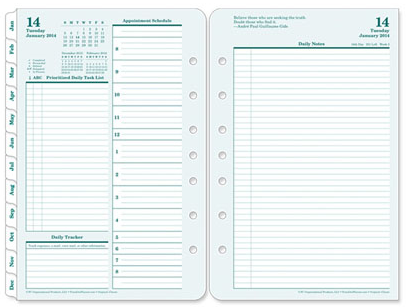 A day planner is different from a diary, a calendar, or a notebook. The trouble for most writers is that they have multiple organizational systems in place. If you're using a calendar in conjunction with a desk diary, notebooks, sticky notes, notes on your phone, and more... then guess what? You're using too many systems, and likely creating overlap. This means wasted time, and the chance for information to get lost. It's essential to have some sort of centralized system for your planning. For my writing, I use Scrivener. This is a great way to organise your plot outline, chapter notes, research, character profiles and more, in the same place as your actual manuscript. We've discussed the benefits of Scrivener here, so I won't repeat that information. Suffice it to say that if you don't yet have it - make it your New Year's duty to get your hot little writer's hands on this software, stat. But the organized writer should also have a centralized system to track their daily life - their goals, to-do lists, daily schedule, appointments, word counts, writing (and other) expenses, and notes. Most standard desk diaries can't deal with all these things simultaneously without ending up in a confusing, inefficient, scrawled mess. I may be speaking from experience. I recently discovered the FranklinCovey day planner and believe it has all the elements necessary to help the most chaotic writer streamline and organize their time. I'm no sales rep for this company - I just like the product and believe it's worth recommending. Here's an image of what you'll find inside. Each calendar day has an appointment schedule, a separate Prioritized Daily Task List, a Daily Tracker (where you can track things like word count, exercise, calories... whatever is pertinent and helpful to your daily goals) and a large page for daily notes. The system includes monthly and weekly overviews, so you can set goals for the month and then break them down into weekly and daily actions. 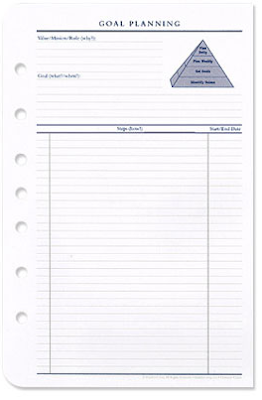 You can also personalize your planner with a variety of additional forms and inserts. 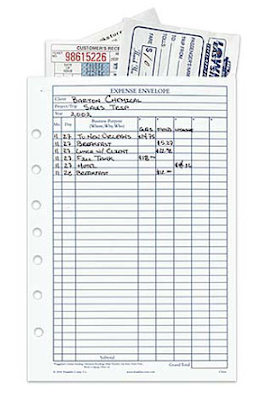 ... And many more additional forms, including vehicle logs, dedicated exercise trackers, meeting notes templates, and so on. I'm excited about the potential to have everything in one place. As a busy mum of three small kids, I need to be able to plan several things simultaneously - writing and blogging schedules, activities I've planned for my kids, and daily appointments. Last year I used two different diary systems to try to co-ordinate the different aspects of my life, and needless to say, this approach was not a rousing success. Here's to consolidating, streamlining and organizing ourselves for a fresh New Year. Do you use a day planner? What other tried-and-true organization methods do you swear by? What steps would you like to take to organize yourself for this new year? 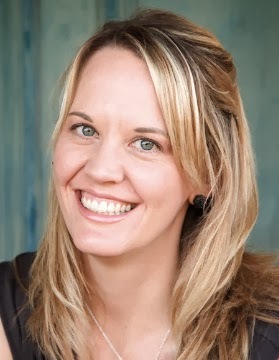 Karen Schravemade lives in Australia. When she's not chasing after three small children, she spends her spare minutes daydreaming about the intricate lives of characters who don't actually exist. Find her on her website and Twitter. Karen, You sound so organized. I've tried using daytimers in the past and always forget to update them! LOL. Kinda defeats the purpose! My system of 'scrap pieces of paper with random notes' doesn't work that well either! Maybe I'll give this system a try! Great post, Karen! I love day planners and Franklin Covey has always been my favorite. I've tried online planners, but I love the feel of checking things off as I complete each task. I've got to look into Scrivener. I've heard so many wonderful things about it. Happy New Year! Karen, I love this post and feel so inspired! I'm bad about not being organized! Thanks for sharing! SUE - Happy New Year to you too! You wouldn't be the first person to use scrap bits of paper as a "system". I must admit, I do love organising, although I'm never quite as organised as I would like. It's always a work in progress! I hope you find a system that works for you! JILL, yes, there's nothing quite like ticking or crossing an item off the list using pen and paper, is there?! I keep my diary or planner open on my desk at all times - no booting up a computer to see my daily task list. There's something nice and immediate about it. AHH! I hang my head in shame! I probably have as many organizational systems as I do stories, Karen! Whoa!! Hmmm...organization is one of the areas of life I struggle most with. Have wanted to do a planner system. Yes, it terrifies me too. Baby steps, LOL. PEPPER, OneNote is a great system!! I've never used it, but I've heard good things. Doesn't matter what the system is, as long as it works for you. JULIA, don't be scared. Total chaos is more scary than a bit of organisation - LOL! But in all honesty... NONE of us are ever as completely organised as we'd like to be!! Don't let appearances fool you, there's a bit of chaos in all of us! Organisation is a journey. Baby steps sounds perfect! Once you conquer one small area, even if it's just a single drawer, it will make you feel so good about yourself and give you motivation to tackle the next project! You can do it!